Today most of the students after Plus 2 not have a definite plan or idea regarding their future career. 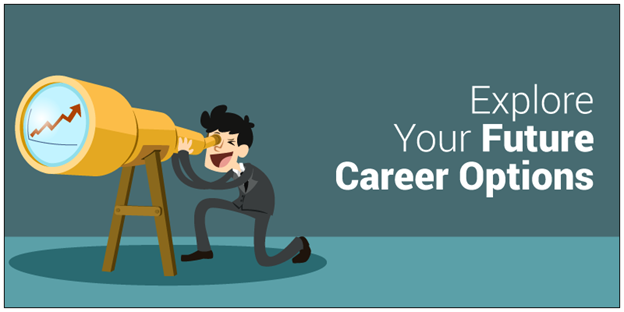 This article helps to choose the exact path for a student after his/her completion of Plus 2 and how to become successful in that choosed career. It is a well known fact that there are around one crore of students writing the 12th standard board examination across the nation. From this, it is evident that these exams would be a turning point in each student's life. Once the results are out, both the students and parents would be experiencing sleepless nights. It is a crucial point in the student's life where they have to make career options that would lead them to excel in their professional and personal lives. Now comes the big question that arises in every student viz. "What's next? ", once they are done with the board exams. Most of them have already chosen a stream that they want to pursue after class 10th. But one may change one's mind in two years of time gap. Some might even have thought of preparing for PMT or IIT-JEE as it is always better to have a backup. Students preparing for various entrance exams usually rely on NCERT Solutions. The reason behind this is the fact that these books help to upgrade one's own knowledge quotient. NCERT Solutions are prepared by the country's top expert academic writers and teachers. The contents are explained in such a detailed manner that it is easy for even a layperson to grasp and to understand concepts. Also, one of the advantages of NCERT Books is that they are easily available online. There is a large stream comprising several courses with a large number of opportunities in future. One of the only advantages of science students is that they can either opt for other streams in humanities and commerce unlike students under other stream. Science is categorized into Applied and Pure Science. Further, it is subdivided into Biology and Mathematics Category. The first thought that would appear in mind is either Engineering or Medical. However, they are several other courses that one can choose from. Commerce and humanities would comprise of courses related to arts, music, history and so on which has a lot of other subdivisions inside them. MBBS : Students who are keen interested in biology and would like pursue in medical stream can opt for this field. The course offered as follows. Mandatory subjects: History, Geography, Political Science,English. Voluntary Subjects: Economics, Psychology, Sociology, dance, music, Fine arts, multimedia, fashion designing, legal studies, graphic designing, physical education, Entrepreneurship, Philosophy etc..
From the list provided above, one could easily state that students have a vast pool of courses waiting for them once they clear the class 12 level. For further ideas on the courses available after XII standard, it is advisable that candidates should check sites like Byju's the learning app. Kevin Ronith Kumar, Aspiring writer, loves new ideas, out of the box thinker and always up for a challenge. It is true that there are numerous options available for the students who are passing out from 12th Standard. Students should also explore for rare courses, meaning the course will be available only in very limited number of colleges. Following are some of the rare engineering courses. Students who take these course are exposed to more job opportunities compared to those who take the conventional engineering courses. The reason is that these courses are more specific to a particular technology/work. For example, a student who take Mining Engineering course will have good opportunities in coal and mining companies like Neyveli Lignite Corporation(NLC) and Coal India. So students should also consider some of the these courses provided they get interest to study. The article has given good account of various courses available for students who have come out of +2 successfully. There are universities offering B.V.Sc course which deals with veterinary science and the course is equivalent to MBBS. Another course is Integrated MS course of five years duration by BITS ,Pilani and some other Universities. The author has made a good attempt. My appreciations to him.. I opened this article with eagerness and curiosity on getting some help in deciding my career as I am only a 2nd year graduate student. But I am very disappointed because the title talks about career option but the content is all about course option. It's a big fault on the part of author and editors. Author has not provided suitable title according to content or he may have not written the content according to the title. It's also fault of the editor as he should have asked the author to use more relevant topic according to the content of the article. This article explores different areas of each subject. Today, a student is free to choose his/her career from several options available. But, they should be wise enough to decide their career and explore their strengths as early as possible so that they enter into a right field.